We’ve written quite a bit about Hobart’s AirForce 250, and it’s a formidable addition to any shop. But this week Hobart announced its new replacement — the AirForce 250ci — that weighs half as much and includes some exciting new features. 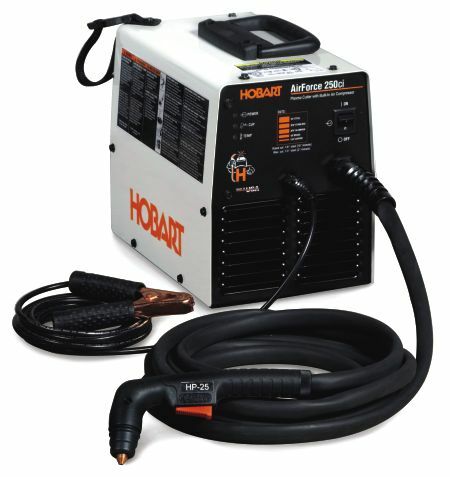 According to Hobart, the new 250ci “allows cutting with an arc up to 3/16″ long” which “improves results when freehand cutting.” Like the old 250, it runs on 115V and includes a built-in air compressor, making it an incredibly portable unit — especially at the new weight of just 27 pounds. Hobart says the 250ci is targeted at home hobbyists, farming, and auto body applications, and we’d wholeheartedly agree. Plasma cutting — and the 250ci in particular — is a good alternative to oxy acetylene for the home shop and a good addition to it for larger shops. MSRP is $899, but street pricing starts around $800 (as does Amazon). That’s a great plasma cutter for that price. You can’t beat Thermal Dynamics. And why would you want to pay a little more for a unit that isn’t comparable in its feature set? Sure it will cut a little more, but that puts the unit outside of the intended equipment class for the AirForce 250ci. Not all guys want or need that thickness, that aside; the TD Cutmaster doesn’t stand up in comparison for a number of reasons, including the price. The TD Cutmaster 38 doesn’t feature its own internal air-compressor, that would be an additional cost (up to S500 for a good one) that the operator would need to plunk down. Hobart AirForce 250ci (with the internal compressor) – 27lbs. TD Cutmaster 38 (standalone – no compressor built in) – 43lbs. Hobart AirForce 250ci: Pilot Arc control – Keeps the arc continuously running on expanded metal. TD Cutmaster 38: Auto Pilot Restart – Restarts the arc on expanded metal whenever it goes out. From what I see on CyberWeld.com, Hobart’s 5/3/1 warranty is listed: (5 years on original rectifier parts, 3 years on the power source, and 1 year on the torch, parts and labor). There is no warranty listed on CyberWeld.com for the Cutmaster 38. There seems to be more information readily available on the Hobart unit, and I’ll easily admit it, I’m a lazy guy who doesn’t like to work too hard when comparing units. Even if I was considering cutting 3/8, I’d probably move up to an AirForce 400 knowing the quality of the product. I just got a Hobart Airforce 250, NOT a 250CI. and i can tell you that it weighs about 27 lbs and looks alomost identical(the face plate and switch is just a mirror image of the new look) and i dont know what are the “exciting new features” differences it has? can someone explain? Thickness is not the only advantage off more current. The CM 38 puts out a maximum current of 30 amps. Which relates to increased cut speed and more versatiliy. As a standard all Thermal dynamics products com with a three year warranty on the entire power supply and now they have release a new series of cutter that all have a four year warranty. But after using a Thermal dynamics product for 5 years now I know that you will not need to use that warranty. The torch is extremely universal and just about indestructable. Thermadyne who is the manufacturer of thermal dynamics products offer products comparable to the hobart unit under the name Drag gun see attached link http://www.thermadyne.com/IM_Uploads/Literature/lit_185_300X2682.pdf for the users manual. Sounds too good to be true. Anyone? ?